In his 1972 cultural manifesto The Trinidad Carnival: Mandate for a National Theatre, playwright, actor, and theater historian Errol Hill states, “the carnival illustrates vividly that speech, song, dance, and music should be inseparable components in the Trinidad and Tobago theatre” (Hill 116). Nobel prize-winning playwright and poet Derek Walcott, a native of Saint Lucía who has dedicated his artistic career to theater in Trinidad, professes a much more ambivalent attitude toward incorporating carnival and folk arts into theater. In his essay “What the Twilight Says,” Walcott accuses the state of debasing and commercializing Trinidad’s music, dance, and carnival rituals. Nevertheless, in his musical The Joker of Seville, first performed by the Trinidad Theatre Workshop in 1974, Walcott includes an abundance of calypso—a Trinidadian song genre. The Joker constitutes a creative rewriting of Tirso de Molina’s Spanish Golden Age classic, El burlador de Sevilla, first performed circa 1640. Walcott’s inclusion of song distinguishes his Caribbean transformation from de Molina’s original, which only incorporates several songs sung off-stage to communicate moral messages. 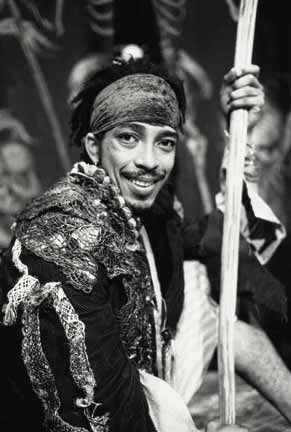 Indeed, when the Royal Shakespeare Company commissioned Walcott to write and direct an adaptation of de Molina’s famous play in 1973, Walcott stipulated that he would write and produce a play for Caribbean actors and audience members. An important part of Walcott’s Trinidadian setting is calypso song. More than simply adding a touch of local color, the calypsos, I argue, comprise an important mode of expression within the dramatic action of The Joker of Seville. The songs’ lyrics showcase Walcott’s creation of a distinctly Trinidadian dramatic language that constantly mixes cultural registers and weaves West Indian phrases and syntax into so-called standard diction. In The Joker of Seville, song, and specifically the calypso, enables characters—including the most disenfranchised—to deliver social critique, express censored desires, and threaten hierarchies. In short, the calypsos challenge vestiges of colonialism rooted in societal norms, especially those governing sexuality. The sung interludes, separated by speech only through italics and a parenthetical direction–(sings), create dramatic spaces in which irreverence and ambiguity flourish. The way that Walcott integrates song throughout both acts of The Joker of Seville supports Errol Hill’s advocacy of organically including music, song, and dance in Trinidadian theater. Sarah Piazza, a PhD candidate in Comparative Literature at Yale, is excited to have handed in her thesis: Performing the Novel and Reading the Romantic Song: Popular Music and Metafiction in Tres tristes tigres, Sirena selena vestida de pena, La importancia de llamarse Daniel Santos, Le cahier de romances, and Cien botellas en una pared. In it, she analyzes how references to popular musical genres heighten the novels’ metaliterary abilities to reflect on creative processes, including musical performance and writing. While her thesis focuses on contemporary novels from the Hispanic Caribbean, she is broadly interested in Latin American literature that creates connections between art forms. Work related to her thesis has appeared in Latin American Theatre Review and in the forthcoming issues of Retorno and MESTER. She is currently a teaching assistant for Professor Joe Roach in his undergraduate course, Survey of Theater Studies. Her PSWG presentation grows out of the performance project that she is working on with her creative Theater Studies students!